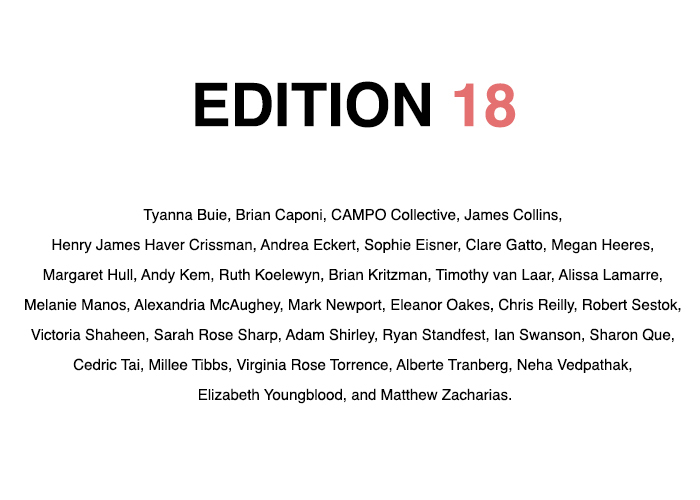 EDITION 18 – Opening Reception TONIGHT! It’s the most wonderful time of the year – EDITION time! I’ll be debuting some of my newest work, a series called Detroit Patchworks. Getting it all figured out! Tyanna Buie, Brian Caponi, CAMPO Collective, James Collins, Henry James Haver Crissman, Andrea Eckert, Sophie Eisner, Clare Gatto, Megan Heeres, Margaret Hull, Andy Kem, Ruth Koelewyn, Brian Kritzman, Timothy van Laar, Alissa Lamarre, Melanie Manos, Alexandria McAughey, Mark Newport, Eleanor Oakes, Chris Reilly, Robert Sestok, Victoria Shaheen, Sarah Rose Sharp, Adam Shirley, Ryan Standfest, Ian Swanson, Sharon Que, Cedric Tai, Millee Tibbs, Virginia Rose Torrence, Alberte Tranberg, Neha Vedpathak, Elizabeth Youngblood, and Matthew Zacharias.